The Redway Runners were out in force for the London Marathon, with nearly 60 green vests taking to the streets of the capital. Despite the heat personal records were set by many runners on the flat course. 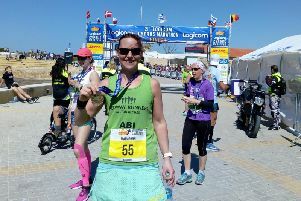 Notable achievements included a 3:21:00 finish by Jen Sangster, 3:32:47 PB by Katie Tucker and a 3:49:55 finish by Marice O’Connell in the 65-69 age group. Redway Runners is an inclusive running club based in Milton Keynes, with over 1000 members and sessions every day of the week. The club runs the Zero to Hero marathon programme yearly and encourages both new runners and potential mentors alike to get involved.